With year-round sunshine and rising electricity rates, more and more people in Jalisco are turning to solar energy. Jalisco is home to more solar panels than any other Mexican state, and the majority of these are found in the expat community at Lakeside. 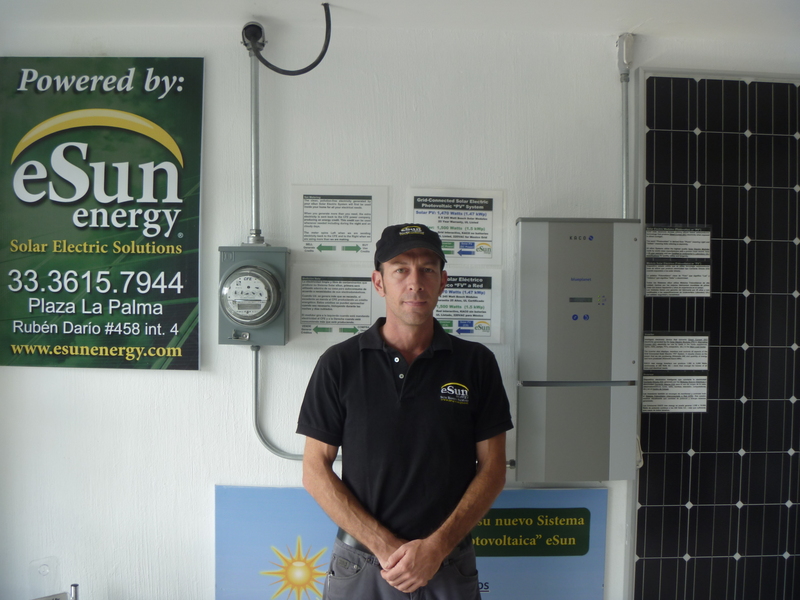 The Lake Chapala area has become known as the “solar capital of Mexico,” says Jsun Mills, a Californian who founded eSun Energy in Ajijic around five years ago. eSun has another office in Guadalajara and in January opened a third outlet in Puerto Vallarta to tend to clients on the coast from Colima up to Nayarit. Installation costs depend on geography, Mills explains, with houses on the coast typically using much more electricity (mostly on air conditioning) and requiring more panels than those inland. In Guadalajara or Chapala, installation normally costs between 7,000 and 15,000 dollars, while on the coast it tends to vary from 10,000 to 20,000. Electricity bill savings are from 75 to 100 percent each year and it usually takes four to four-and-a-half years to make back the money invested. There was no solar energy market when he arrived here, says Mills, who has utilized his 14 years of experience in the industry to build such a market. 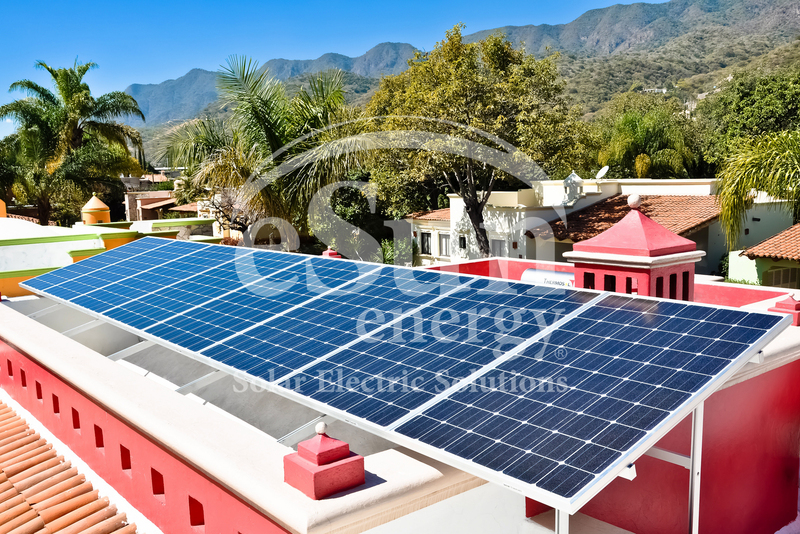 As reward for his endeavor, eSun now has more panels installed than any other solar energy company in all of Mexico. Another potential problem eSun has overcome is the fact that the “CFE is supposed to provide digital meters but they typically don’t have them,” Mills says. “So what we did is go out and buy them directly from the manufacturer and we turn them into the CFE on behalf of our clients. Mills is clearly proud of his work, keenly pointing out that “all of our businesses are making more than 100 percent of our electricity” and have even built up surplus credit with the CFE. Among eSun’s rivals in the solar energy sector is e2 Energias, founded four-and-a-half years ago by Guadalajara-born Guillermo Corona Jazo and German citizen Frank Weiss. Their primary product is interconnected photovoltaic (solar panel) systems, although they also install solar thermal collectors for heating water or warming swimming pools. With offices in Guadalajara, Puebla and Morelia, e2 also operates in Puerto Vallarta, Cocula, Queretaro and Oaxaca. They have sold solar panel systems to around 280 clients nationwide, of whom about 190 are from Jalisco, including 120 in Lakeside, Corona says. “Two years ago there was more demand in Lakeside but there’s now more of a boom in Guadalajara, although obviously it’s a bigger city,” he adds. Corona is proud of his company’s “quality product,” noting that all e2 systems use Sharp technology and are guaranteed for 25 years. Sharp is a world leader in solar cell production, a manufacturer that will still be going strong in 25 years, unlike other rivals with less weight and experience behind them, he suggests. Both Corona and Mills agree that “word of mouth” is crucial in the industry, with customers quick to recommend companies that offer a good service or badmouth those who do not. I’ve used e2 Energias at my home, they’re great from beggining to end, my electric bill went from $5,000 pesos, to less than $100, thank you Guillermo! My fiancé and I are looking to build a new home and have it completely run off a solar power system. We live in morelia michoacan and are having a hard time finding installers, designers, etc… For a home which we plan to start building this year. Any info or services you could provide would be greatly appreciated. Here is my email : renonv1981@yahoo.com. Hi Derrick, thanks for reading. Unfortunately the companies mentioned in the story are the only ones i know of but I don’t think either operates in Michoacan. You could try contacting them though, they may know of someone that can help you out! I love your article and agree 100 % in going green. I have a question for you. Can people build ” green ” in Mexico. For example can one build a strawbale house or Earthbag house. Would this comply with Mexico’s building codes..? ?